This is a picture I shot of pro skateboarder John Cardiel, at a demo at Livingston concrete park in 1992. According to my notes he was sponsored by Black Label at this time. He skated at the demo with American pros Salman Agah, Mark Gonzales, Karma Tsocheff and Ron Chatman. Cardiel was was not the best-know guy amongst the crowd but he was by far the best skater that day. John Cardiel did totally tweaked indys and a frontside noseslide IN THE POOL [sic]. Sadly I don’t have any shots of those, but he does one in this video at about 4:30. 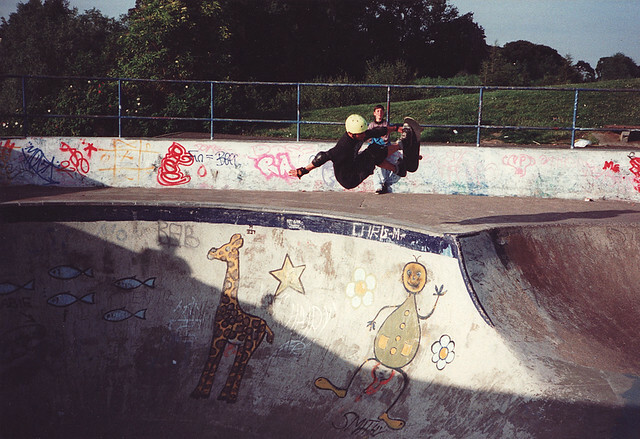 It’s bootleg footage of a skate film called Notts Landing, taken from a demo session at a ramp in Leigh-on-Sea. the vid has been taken down, must have been ripped from a skate video, sadly I don’t know which one. Above is the only shot I have of him in Livingston’s concrete vert pool, but sadly, I don’t have any of the nose slide or ‘totally tweaked indys’. The pool shot conveys a little bit of the speed, as he whips around the transition, but it doesn’t really show you how steep or deep it is. If you stand on the lip, or in the flat bottom, the 8ft-ish height of the thing is scary. And Cardiel tore around it without any pads or helmet. 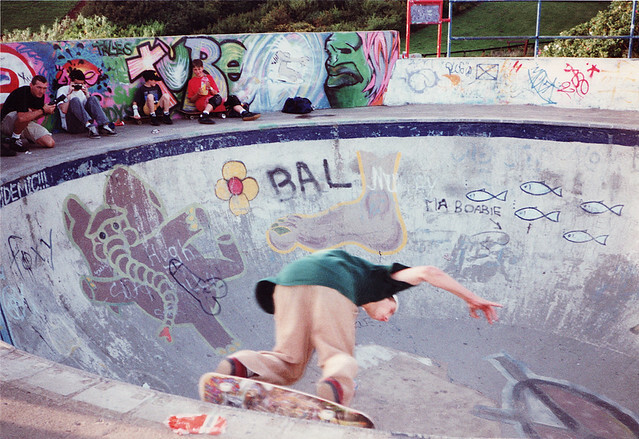 The pic above kind of illustrates John Cardiel’s carefree attitude- experienced local boy Jamie Blair did a solid session in the pool, getting air several feet above the lip, carving around the coping and generally ripping it up. But in a helmet and full knee, elbow and wrist pads (no disrespect Jamie!). John, however, launched himself into a pool he had never ridden before and mastered it in no time, to uproarious cheers from the crowd. These are the types of people that make really great pro skateboarders, snowboarders and surfers. The kind that aren’t afraid to take risks and conquer huge ramps, jumps and gaps. After posting the photos, I did a bit of web searching to find out what the skaters I pictured were up to now. I discovered that John Cardiel had a major fall in Australia in 2007 and was paralysed for several months. It’s documented here on the website of Skateboarder magazine. They describe him as one of skateboarding’s greats. He was the sort of person that didn’t pay too much heed to risk, and was a much more exciting rider for it. But a freak accident has caused him a lot of damage. He is back on his feet again, as can be seen in this VBS.tv interview (warning strong language). Although he’s not skating as he was, it’s a miracle that he’s even walking at all. It sounds like he hopes to skate again one day- good luck John. PS- he’s a reggae fan- sweet!